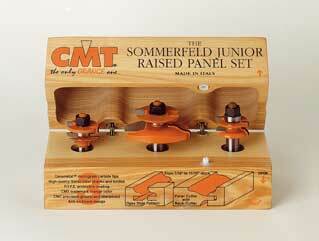 Our popular Sommerfeld Junior Raised Panel Set is now available with the ogee raised panel profile. Used for making raised panels as small as 2-3/4�� square in material as thin as 7/16�� and up to 11/16�� thick. Use this set to produce jewelry boxes, humidors and clock cases with beautiful raised panels. Even library panels and coffered ceilings can be produced with beautiful frame and panel craftsmanship. The Sommerfeld Junior Set includes the Raised Panel Bit with back-cutter and the matched Ogee Rail & Stile pair, packaged in a protective hardwood case. 1/2� Shanks.